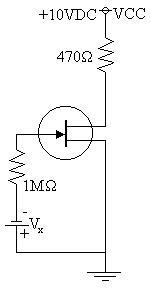 The objective of this lab is to construct a fixed bias circuit using a JFET. Then to use that circuit to determine if a change in the resistor connected to the G connection will affect the operation of the circuit. Then to plot the current flowing through the transistor as a function of voltage. 1)	Q:	Does changing the value of RG have a significant effect on the operation of the circuit and why? A:	No, The Drain - Source voltages are extremely similar between the two data tables, this is expected as IG is always taken to be 0mA causing the resistor to an insignificant component. 2)	Q:	Is the assumption that VP = -6V a valid one? A:	No, the tables show that the pinch off voltage occurs between VGS = -4V and VGS = -5V. From this lab it is concluded that the value of the resistor attached to the gate input of a JFET has no effect on the operation of the JFET. I would like to comment that I took the opportunity to calculate ID using two different methods: The first was the expected one using Shockley's equation. The second method was to calculate the voltage drop across the drain resistor and, using that value, calculate the resulting current. I was surprised at the difference in results, however i do believe that the results given from the second method are more applicable and yield a more accurate curve. 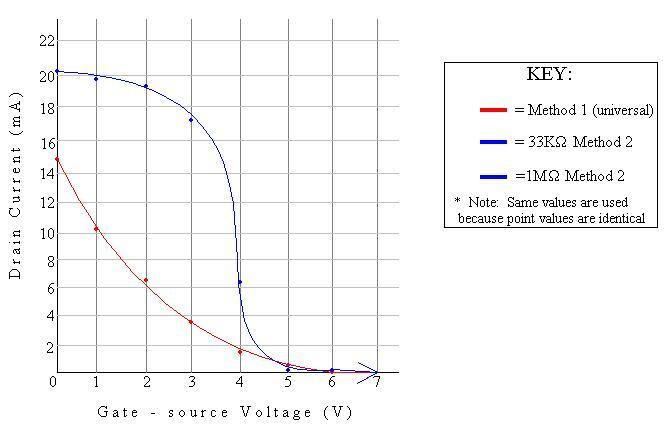 The curve yielded is also closer to the actual curve expected from a JFET transistor.